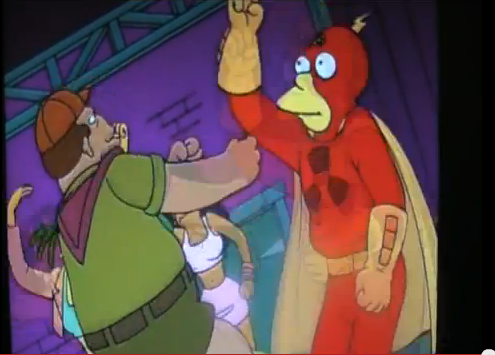 ...and you can see him here, in the 1995 Simpsons classic, Radioactive Man. I heard Barack Obama put in his two cents on the issue yesterday (seriously, this guy is like a clucking chicken. Is there anything he doesn't have an opinion on, and does he ever believe there's a moment where the world doesn't need his wisdom? A yenta, as they would have called him in the old country), saying nobody should be barred from the Boy Scouts. Of course, as a private organization, Obama's doesn't have any say in their internal affairs, although he can bring the weight of Justice to bear on them, as he has to many a political enemy. But, with the election over, and the gay vote/gay money already pocketed, why antagonize some swing voters that may decide a contested Senate seat? Hard for it to be for the president to understand, the decision to limit the Scoutmaster role to heterosexuals is not borne out of hate, but practicality. Or to put it another way - would Barack let his daughters, Natasha and Malia, take a weekend trip in the woods with a man that he knew only causally? Or would he feel better were it a woman, and an avowed heterosexual? Put your daughters where your mouth is, Barack, or STFU.